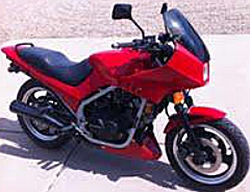 The 1985 Honda Interceptor for sale is a 1985 Honda VF500F Interceptor V-Four comes with extra parts and the shop repair manual included. The bike has a new rear cross drilled rotor, a new rear sprocket, new front sprocket, new chain, new front fork seals, new grips and sliders, new air filter, new spark plugs, new fuel filter, brand new battery, new front tire, new rear turn signals, newer rear tire, new front brake pads and new rear brake pads. It has been stored inside and the bike's body and plastics are in good shape. The seat was reupholstered awhile back, the oil and filter have just been changed and coolant flushed and I just cleaned all four carbs. The speedometer drive gear broke while I was riding it but I have already ordered the parts to fix it but beyond that everything works fine. It's not perfect but it is in good shape with just 27,756 miles on it and needs a new home and a rider that will appreciate it and care for it. Those of you that know a thing or two about this bike can use the comments form below this ad to write a review or voice any opinions that you may have formed from your personal experiences with a vintage motorcycle similar to the 85 model Interceptor listing any problems with its performance, where to find used Honda motorcycle parts to use for maintenance and/or repairs or anything of interest that you feel potential buyers should know. Thanks for visiting GoGoCycles Used Motorcycles for Sale and for your interest in the 1985 Honda Interceptor for Sale . The location of the 85 Interceptor for sale is Milliken Co near Denver CO Colorado and in my opinion my asking price is cheap enough that it will be difficult to beat on Craigslist or on Ebay; just $1300 or you are welcome to submit a best offer when you call me. If you want to take a look or have questions, text me (NO EMAILS) at 720-308-77nine2 for more details or to request picture and don't forget to mention that you found this ad on GoGoCycles Used Motorcycles and Parts for Sale www.gogocycles.com.